The Executive Editor of People Magazine provides an unfiltered and hilarious look at her life alongside the rich and famous, as she reveals how being a fan-girl lead to celebrity close encounters she could only dream of growing up.From the NY Post's "Page Six" to Good Housekeeping and now People, Kate Coyne has spent years on the front lines of the entertainment industry, feeding our insatiable appetite for celebrity news and gossip. I'M YOUR BIGGEST FAN chronicles her journey from red-carpet reporter to upper-level editor and the countless surreal, surprising, and awkward interactions she had with stars along the way. 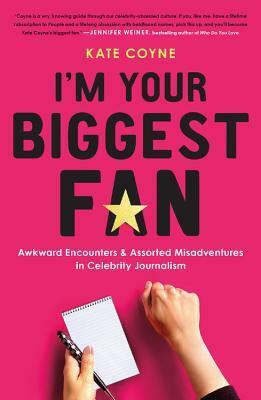 Featuring A-listers such as Michael Douglas (who warned her about tabloid reporting), Tom Cruise (whose behavior will surprise you) and Tom Hanks (who, yes, is wonderful) Coyne's stories reveal insights about pop culture's biggest icons-and the journalist who has followed their every move. With an entertainment career spanning nearly twenty years, Kate Coyne is a leading expert for celebrity news. A graduate of Oxford University in London, England, she is currently the Executive Editor of People magazine, where she oversees television, film and music coverage. Kate has also worked at Page Six and later, Good Housekeeping magazine. She lives in New York City with her husband and two children. When I first started this book I kinda thought I was reading some stalker's diary about their obsessions. But shortly getting into it I realized this was going to be one funny story. Its a collection of tales that happened to the author and well don't eat or drink anything while reading this or you will spill, choke, and cough your way through this hilarious book. I'd answer with Jerry Seinfeld - I'm really enjoying his CCC series and we recently got to see him doing standup - he still does it these days! Wow. This book sounds cute, specially for fangirls like me.